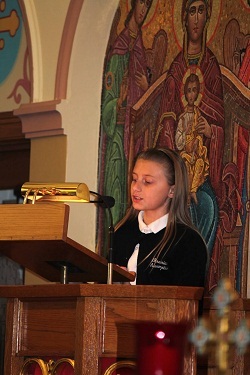 On Sunday, January 27, Father Ivan Turyk celebrated a very special Divine Liturgy to mark the opening of Catholic Schools Week at Assumption Catholic School in Perth Amboy, NJ. 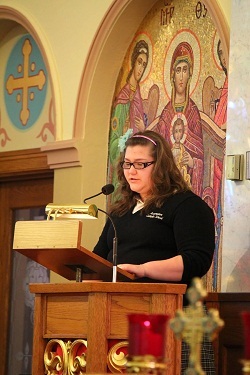 During the Liturgy several students read their essays about what makes ACS so special. When Liturgy was finished, Father Ivan called Sister Yosaphata to the front of the church and presented her with a special Papal Blessing sent by Pope Benedict XVI. This blessing was given in recognition of Sister’s 50 years in the service of God. ACS Student Council met parishioners at the back of the church and presented them with baskets containing “hugs”. They had spent the week before weaving the baskets and gave them to the parishioners for the support they have given to the school. Monday of this week prove to be the start of a very busy week. Student participated in various activities including fifth graders building towers with geometric shapes. Mrs. Lawrence said that the structures were tested by “Hurricane Lawrence”. Grade2 played bug bingo while the upper grades watched Fantasia 2000 and treated to popcorn and lemonade by their teachers. Tuesday found classes once again participating in fun activities like spelling bees and multiplication bingo. The Class of 2013 began their jobs of teaching a science class to the younger grades. 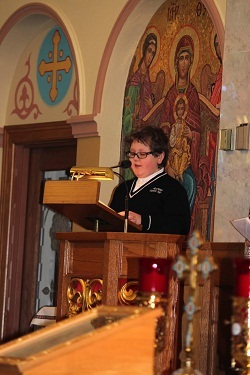 This was only the second school day for Catholic Schools Week activities and great memories were already in place.